Christopher Busietta - What the Fach is a Spieltenor? Blog 9 - What the Fach is a Spieltenor? 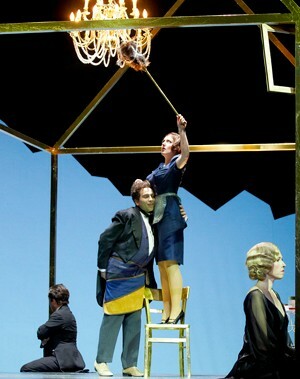 Florian (Christopher Busietta) preparing to ask Lisa (Sophia Brommer) the "fateful question" in Der Ring des Polykrates. This month I am opening a new production of Korngold’s first opera Der Ring des Polykrates in the role of Florian Döblinger. It is one of the biggest Spieltenor roles I have played in my career so far. The tenor range - C3 to C5. Spieltenor? What? OK – first take out the word spiel and you get tenor. What is a tenor? A tenor voice is the highest male singing (and speaking) voice. Male singers born with lower voices will either be baritones, bass-baritones or basses (the lowest male voice). There is also another voice category used in opera called counter-tenor, not to be confused with tenor. Counter-tenors use falsetto vocal production to sing into the female vocal range (think Bee Gees). Typically, music written for a tenor in opera is from a C one octave below middle C (C3) up to one octave above middle C (C5), although some operas have higher and lower notes written. So what then is a Spieltenor? Some of you (especially you singers) might have heard the word Fach. It’s a German word for “specialty” and can mean, amongst other things, skill and ironically, pigeonhole. The sort of roles that an opera singer is able, contracted to or otherwise allowed to sing depends on their Fach, which is decided by the objective type of voice that a person has. 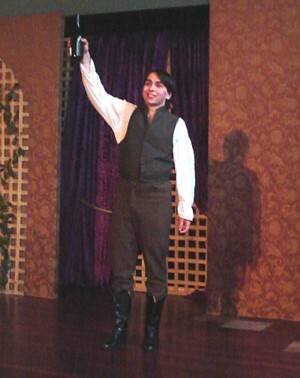 Pedrillo in Mozart's Die Entführung aus dem Serail. One of the great Spieltenor roles in opera. Lyric Opera of Melbourne, 2006. 1. Light lyric tenors (leggiero tenors, Lyrischer Tenor) - the lightest, highest and most flexible voices (eg. Juan Diego Florez, Luigi Alva). 2. Full lyric tenors (Italienischer Tenor) - high tenors with beautiful, fuller voices (eg. Fritz Wunderlich or Nicolai Gedda). 3. Spinto tenors (Jugendlicher Heldentenors [youthful heroic tenors]) - tenors with a large voice, who can sustain a lyrical line, with heroic, ringing, trumpet-like high notes. Normally singing the heavier Verdi and Puccini roles (eg. Luciano Pavarotti & Placido Domingo). 4. Heldentenors (heroic tenors or dramatic tenors in English) - the biggest voices reserved for the louder orchestras, the heaviest Italian roles and Wagner (eg. Ben Heppner or Mario del Monaco). 5. Spieltenors (buffo tenor, acting tenor, comprimario tenor) - tenors who play character or comedic roles. Yeah, so what does that mean? Spieltenor literally translates into “acting tenor” from the word spielen, which means to “play” - and in the context of theatre means to “play a role”. In Italian the equivalent is called the Buffo tenor which means “comic tenor”. So this gives a clue to what a Spieltenor is supposed to be good at. Backstage as Dr Blind in Die Fledermaus. Spieltenors are a weird category when you compare them to the others, because they are less to do about vocal weight and colour and more to do about the types of roles they are playing. The major difference is that Spieltenors are expected to be good character actors. They play comic roles, sometimes villains as well as featured and supporting roles are expected to be able to deliver spoken dialogue convincingly. Spieltenors generally have light voices and need flexibility, but are not expected to have to sing music as demanding as other tenor voice types. The music written is are generally lower in pitch, text-heavy and less lyrical. That is, so that it is much more speech-like. That is why there are very rarely any arias written for a Spieltenor. Although good singing technique and musicianship is required, there is not as much of a need (or indeed an advantage) to have a particularly beautiful voice. In fact, sometimes a stranger, less conventional voice is an advantage in this repertoire. Unclear diction and weak acting are deal-breakers if you sing this repertoire. What is good about playing Spieltenor roles? One thing that is particularly pleasing about this Fach is that you are often playing a greater range of characters as a Spieltenor. Tenors are generally playing romantic leads, such as princes and noblemen. Spieltenors often play a wider variety of characters: servants, villains & buffoons, which mean you get to be a bit extreme in your characterizations.  The downsides are that you always play supporting roles without exception, are not as well paid, and if you are fest (ie. under the normal exclusive theater contract), are expected to do a lot more productions and performances than other singers due to the less demanding nature of the roles. Buffo repertoire is written low in the tenor voice to make it more speech-like and is usually very wordy. Note the higher range & more sustained vocal lines. A little less conversation, a little more singing please. 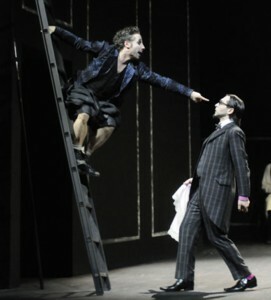 Bardolfo (Erik Biegel) accuses Dr Cajus (Christopher Busietta) of drunkeness in Falstaff. Florian Döblinger, Music Copyist/Orchestra Manager/Timpani Player/Servant to the Kapellmeister, in Der Ring des Polykrates from Korngold is as typical a Spieltenor role as you can get. It does not show off a voice with long lines and high notes and it is written almost as if he is talking. You could get Luciano Pavarotti in to sing this role and I am confident he would not be noticeably better than I am. But don’t make the mistake that this is an easy sing – the music is very, very tricky! As a jack-of-all-trades, larger than life figure, the role requires above all is a sense of mischief, comic timing, physicality and very clear text. Everything you sing, you sing once and it is gone. If the audience don’t get it the first time – you won’t get a second chance to make them understand. Christopher Busietta is playing Florian Döblinger in Korngold’s Der Ring des Polykrates, tonight: Friday 31st May at 7:30pm at Theater Augsburg! IPA Source - Tenor - Definition of Tenor Fach's with roles, singers and audition arias. Wikipedia article on voice types. Wikipedia article on tenor buffo - Written in German, but the best explanation of who is likely to sing these roles.